Greater Anglia has doubled the reliability of its Class 317 electric multiple unit fleet on the West Anglia route through Cambridgeshire, Hertfordshire and Essex. 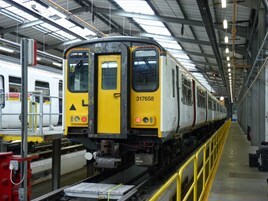 The company challenged engineers at Ilford depot to improve reliability beyond the figure of 8,000 miles per failure. The trains are now averaging 16,000 miles between faults, peaking at 20,000 miles between failures in February. The improvement has taken 15 months, and Ilford’s engineers are seeking to average 20,000 miles between failures on a consistent basis. The most common faults that cause delays or cancellations are with doors and traction motors. “Our team set about researching the most commonly occurring faults. Following a sustained focus on finding permanent solutions to them, we have seen a month on month improvement in the trains’ performance,” said GA Engineering Director Colin Dobson. This is a great achievement by all of the Rolling Stock Engineers and everyone involved in this programme. As Greater Anglia have got enough rolling stocks including extra Class 317's cascaded from Great Northern working alongside the current 317's on the Liverpool Street-Cambridge, Hertford East and King's Linn West Anglia services and to/from Stratford and Cambridge-Stansted Airport service. As well extra Class 321's cascaded from GN to work alongside the current GA 321's on the Liverpool Street-Southend Victoria, Clacton-on-Sea, Braintree, Colchester Town, Ipswich, Harwich Town, Southminster and Witham Great Eastern services including Wickford-Southminster, Colchester-Colchester Town (shuttle), Colchester-Walton-on-the-Naze and Manningtree-Harwich Town services and Liverpool St-Norwich semi-fast stopper service. Before new Greater Anglia Class 720's Bombardier Aventra EMU and Class 745's EMU and Class 755's Bi-Mode "EDMU" Stadler Flirt rolling stocks which are to be manufactured and built and to be delivered for replacing the current older rolling stocks that most of the rolling stocks could be cascaded elsewhere as/if necessary. Same goes with the other Greater Anglia train fleets including Class 90 Intercity, Class 321's, Class 360's, Class 153's, Class 156's, Class 170's and Class 379's. But new trains are coming in 2/3 years time to replace the current fleets used on all lines across the GA network. They should have done something about this before it got to such a low mileage per failure. These units are about to be replaced which is probably why next to nothing was fault wise was done on them until it became so bad to cause a stock shortage.